The plans will be mailed to you on 8 1/2 X 11 paper. 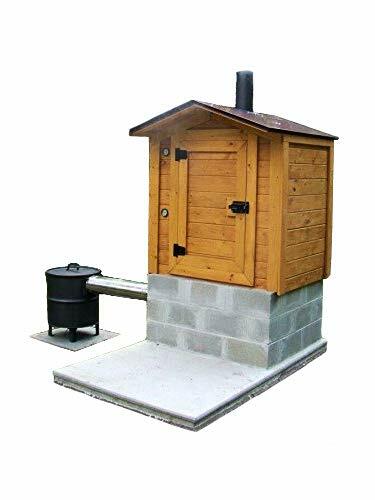 Build Your Own DIY Smokehouse Plans 8' x 6' Smoker Smoke House Building Plan.This is a set of plans for a smokehouse I built a few years ago. I had a old photocopied piece of paper that I had to go by for plans. After I built it I had drawn up a set of plans using more precise measurements and the latest AutoCAD software for accuracy. The plan was altered substantially to account for modern building standards. We have smoked all types of meat and fish in it. We have also smoked fruit!! We even tried smoking cream to make a great smoky tasting ice cream! I will mail you hard copies on 8 1/2 X 11 paper. All plans are designed by Ben Stone. Ben is a retired Engineer in Canada. Ben also drafts these himself using the latest AutoCAD software to ensure accuracy. He studied Engineering back in the early 1980's. After over 30 years in the Construction industry he developed a passion for building cool items around his farm and cabin. He is sharing these with the world for $10 each. These are great DIY projects. With a little skill anybody can Do It Yourself. Ben is always a email away if you have any questions while building one of his projects. He is adding new plans all the time.